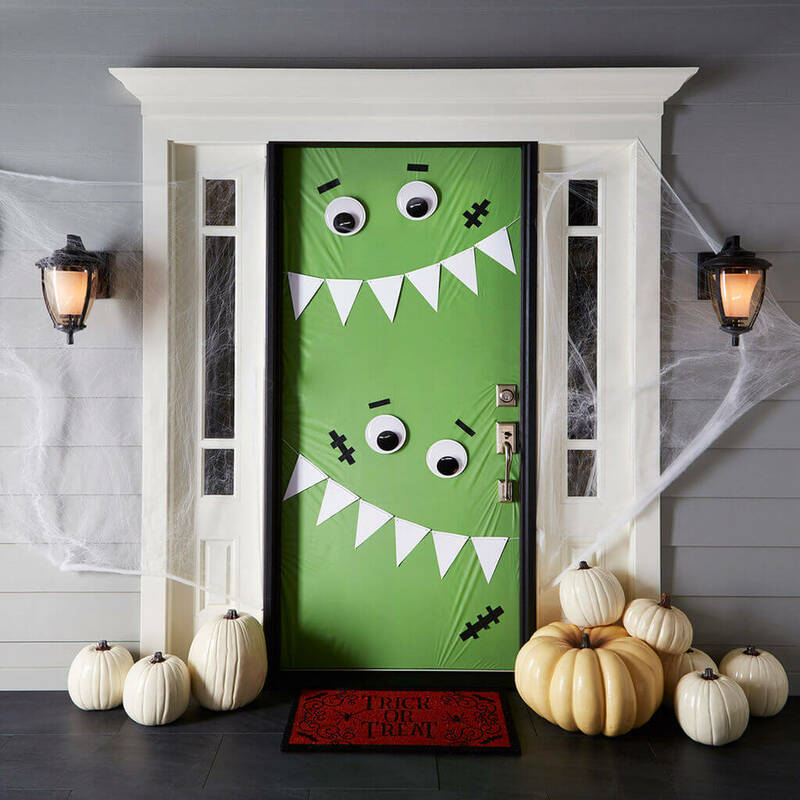 Halloween is just around the corner, so the time is ripe to carve pumpkins, pick out the most outlandish costumes and put up the decorations. Porch, especially, is one of the best ways to share the festive spirit with your neighbors and everyone who comes to visit you. 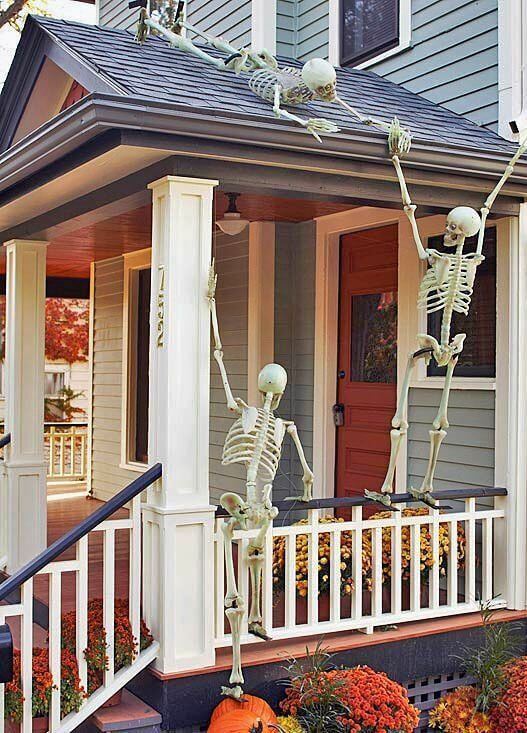 So if you’re looking for some Halloween porch decoration tips, you’re at the right place. 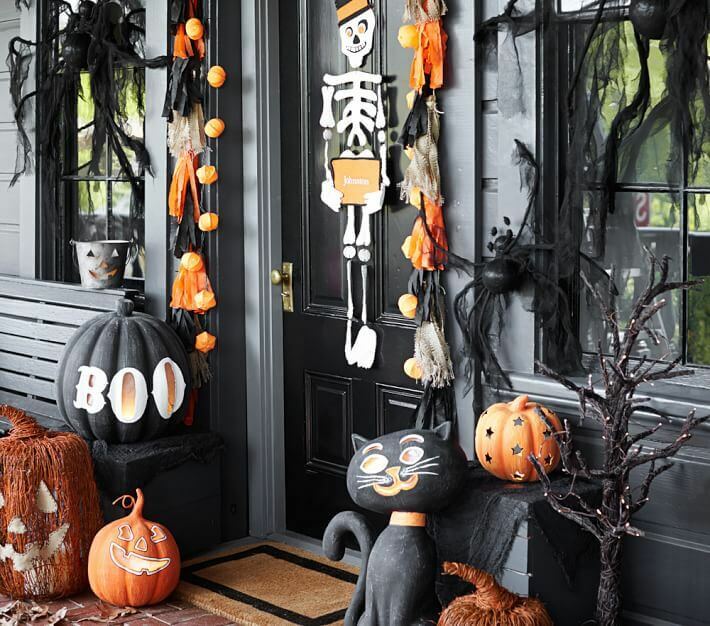 Below is our list of 30 Halloween porch decoration ideas to make your outdoors a bit spookier. Is it a human’s porch, or a witch’s? Because the entire set up suggests the latter. And it seems that the witch is chanting some spells to harm the little one inside the cauldron. 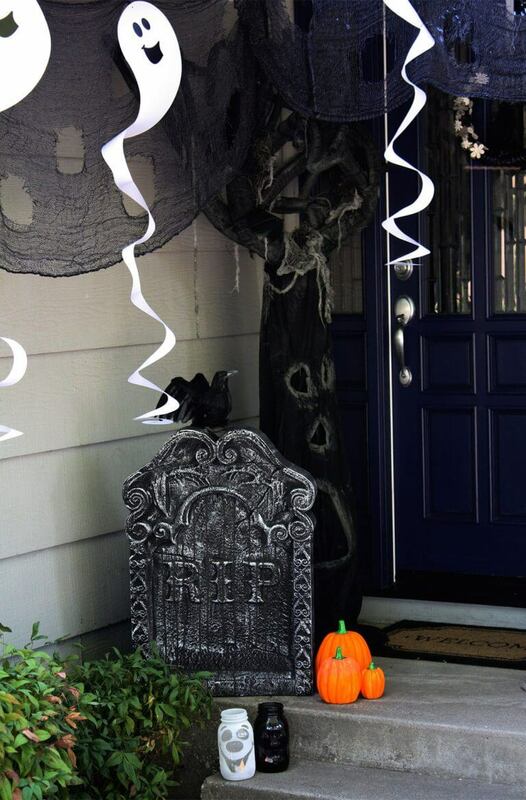 A simple, yet classy Halloween porch setting. 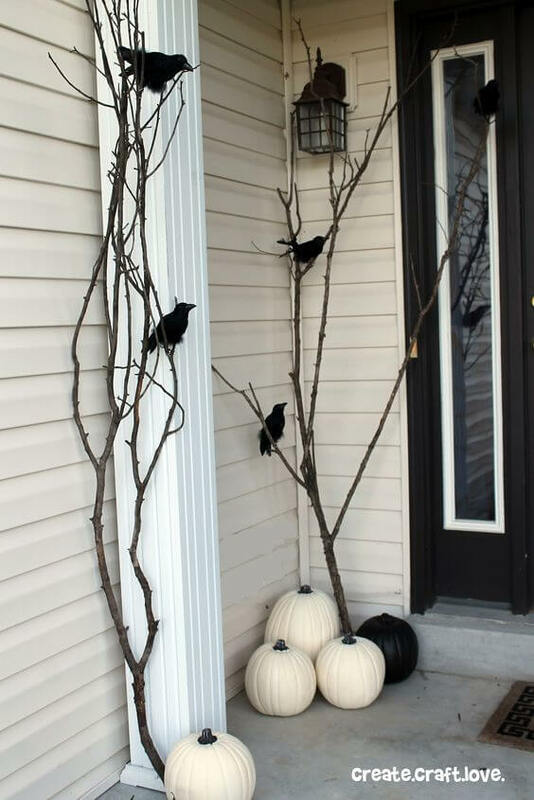 You just have to place a few black and white pumpkins on the corner along with branches and faux ravens. 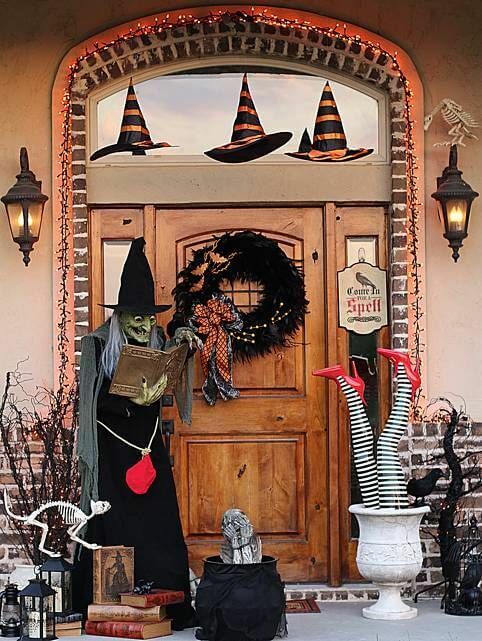 Do you know what we like the most of this Halloween porch décor? It’s the contrasting color of the pumpkin and the door. It’s a relatively easy idea and you won’t have to spend too much time on just one part of the décor. 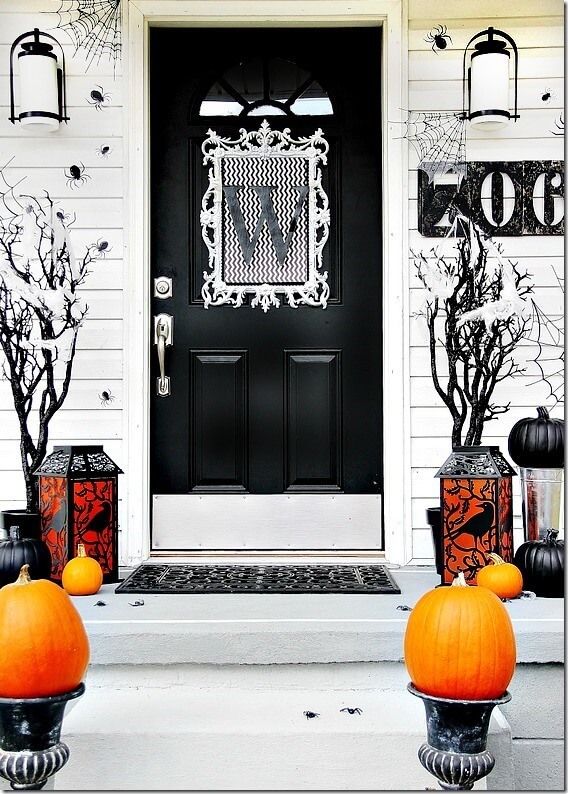 Here’s a perfect example of sophisticated Halloween porch décor done in black, white with hints of orange. 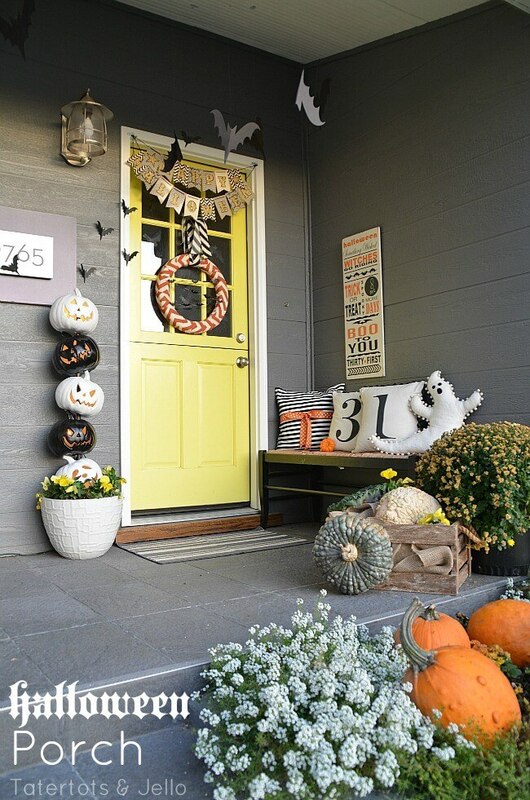 We loved how strategically skulls have been used in this porch decoration. And the cheesecloth is making perfect drape for the doors. But the signboard is taking the cake here. Now that’s some serious BFF goals. The skeleton doesn’t want to let go of his friend, even though there’s little left of him. Now that’s an amazing way to incorporate black in the décor. The black cat figurine is rarely seen in Halloween decoration, so we think it’s a fresh addition. This looks like a scene from a horror movie. 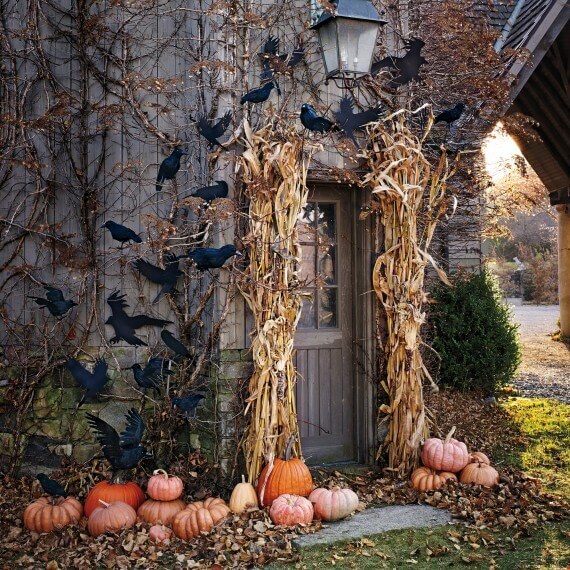 The doorway is flaked with dried corn stalks and the blackbirds are creating an eerie look. Just perfect! 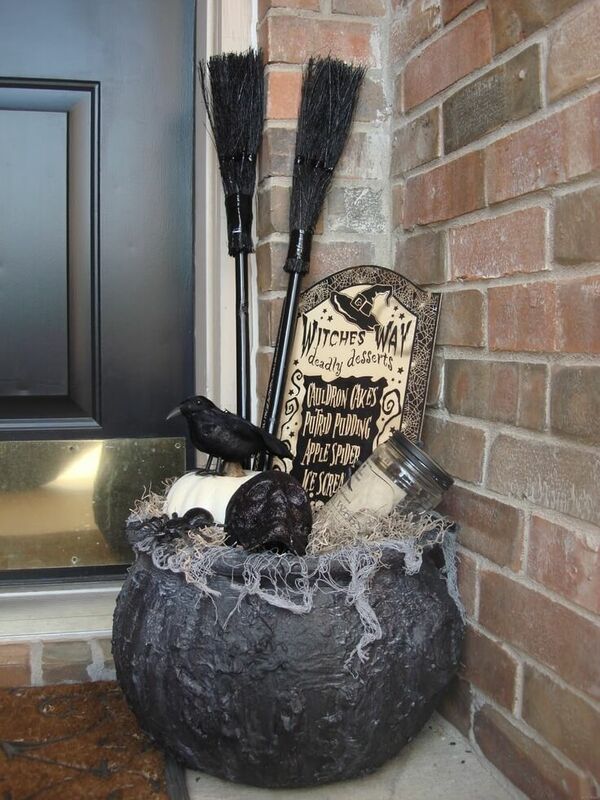 If not anything else, you can place a cauldron filled with spooky and scary items, as shown in the picture. Make sure to set it well, do not just throw the props into the cauldron. 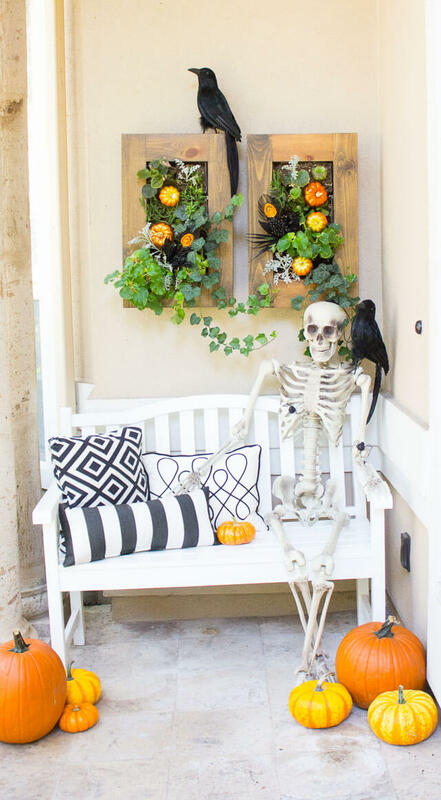 Mr. Skeleton is sitting cozily on the porch here. It seems that the bench was put up for him only. And crows are also placed strategically. This porch captures the spirit and beauty of autumn like no other thing. 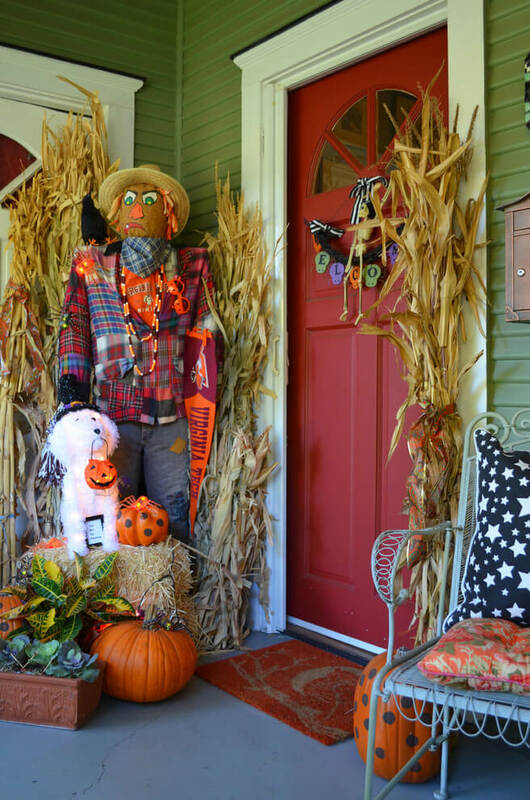 It features corn tusks, pumpkins, jack-o-lanterns and a scarecrow to scare away little trick or treaters. What’s Halloween without orange? It’s kind of mandatory to include orange in the decoration in some form or the other. 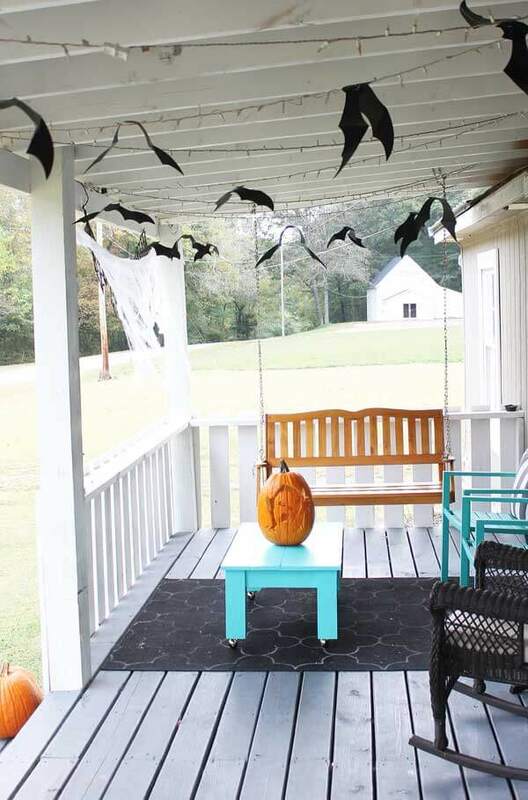 So why not combine it with black, and that too for the porch? Hang paper bats from the rafters using clear fishing line and rafters to make them look they’re flying around. The spider webs are making it look even scarier. 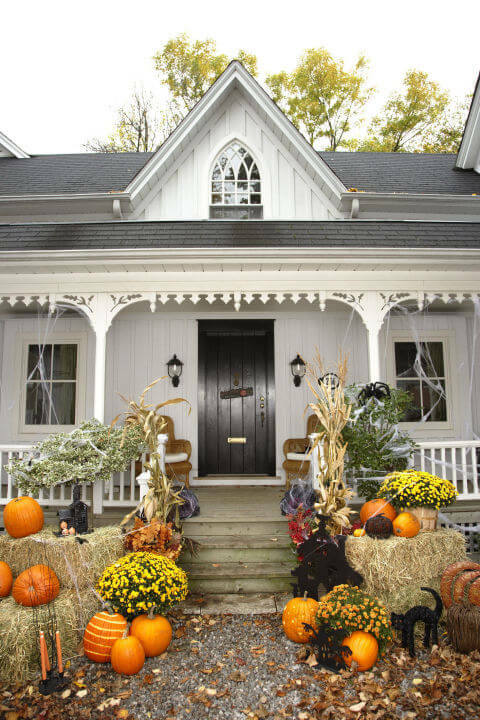 You can even create a classic country style Halloween porch by arranging pumpkins, hay bales and dried corn stalks on the porch. We’re sure your eyes must be on the bats flying across the door, but we loved the clay jack-o-lantern placed on the stair. 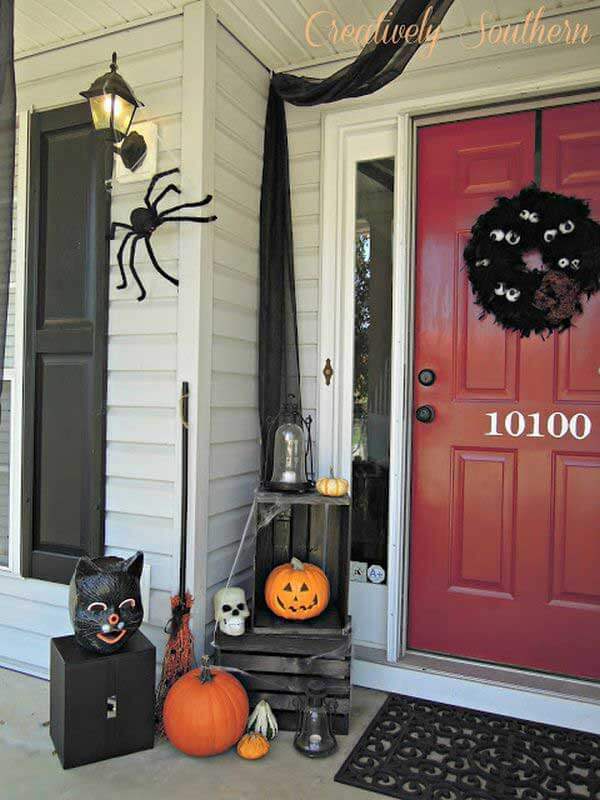 Here’s a simple and low key Halloween decoration compiled keeping autumn colors in mind. The black fur wreath with stripes and polka dots is definitely the highlight of the décor. This one will require a bit of work as it requires painting the floor as well. But the props used are quite children friendly. 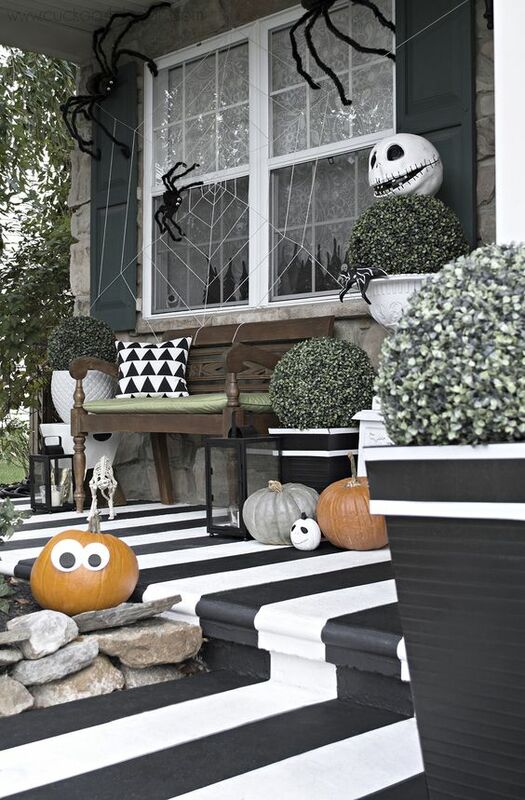 The spiders actually look faux and the pumpkins look funny, instead of scary. 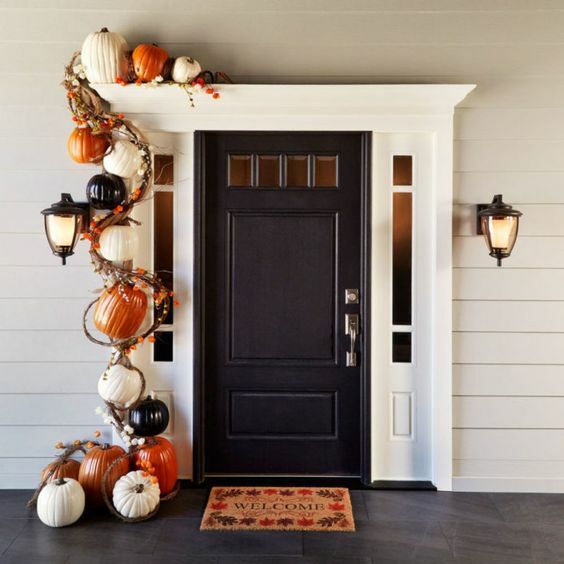 Have you ever seen a pumpkin garland before? We haven’t! And that’s what makes it super cool and amazing. What we liked more is that it’s covering just one side of the door. 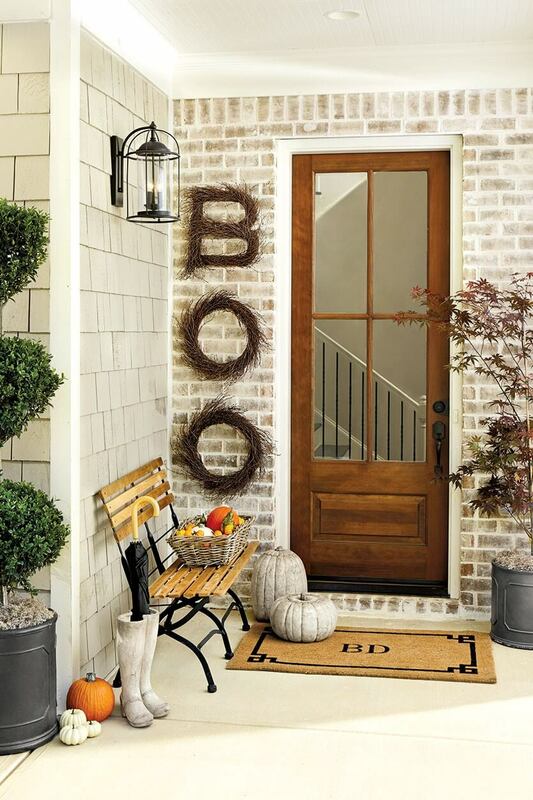 This front porch decoration gives a subtle nod to the Halloween with BOO stenciled on burlap squares. 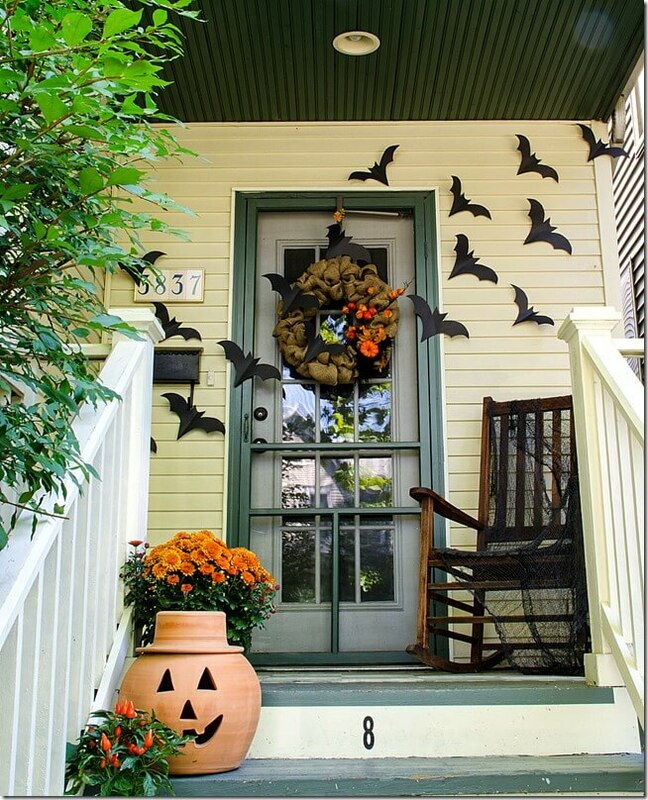 Here’s another bat porch idea and now we’re confused, which one we like more. This one’s a bit on the whimsical and fun side, with the black and white jack-o-lanterns and stuffed ghost. 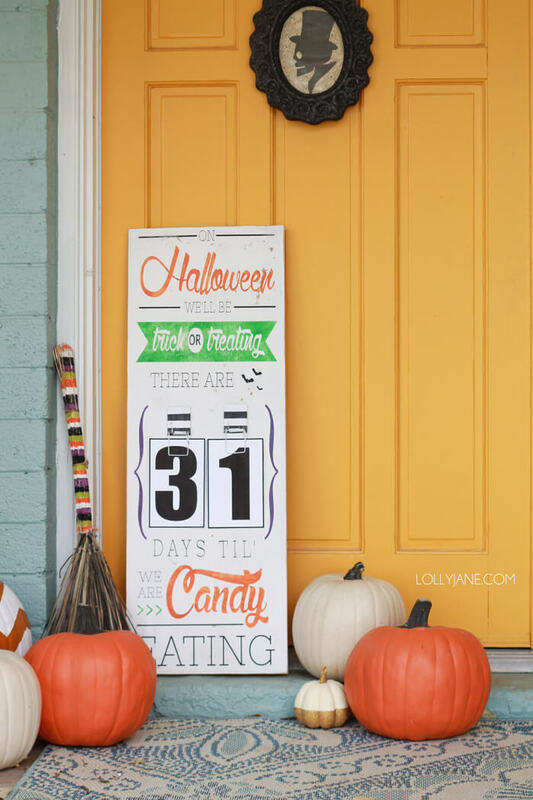 If you’re finding hard to wait for the Halloween, place a sign board on the porch to remind you of the days left for the festival. 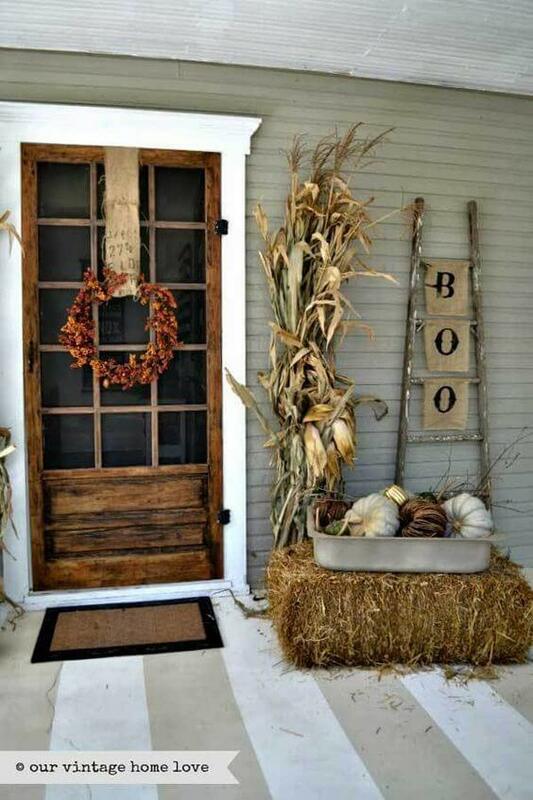 You can even use hay bundles to decorate your porch. 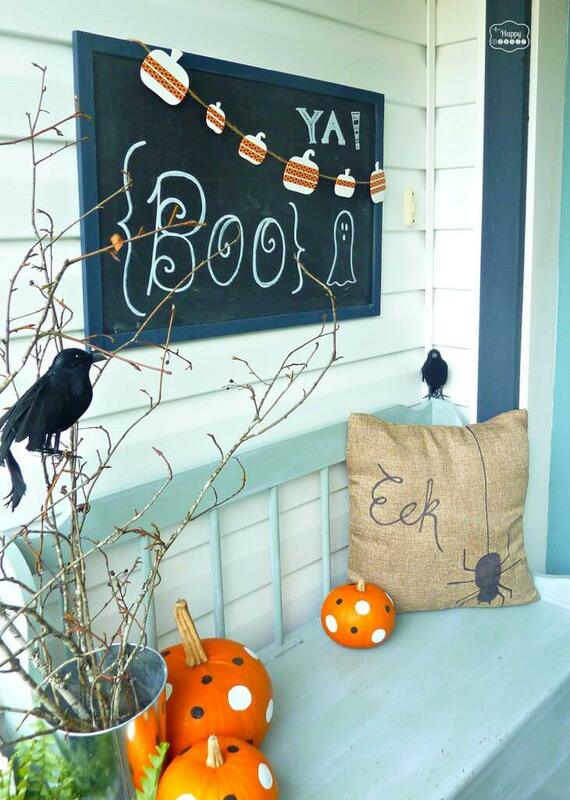 Just top it with faux crows, pumpkins and a skeleton on the rocking chair. 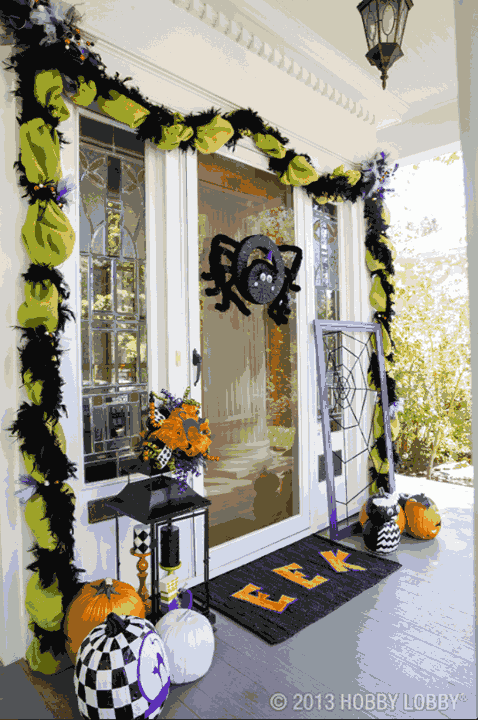 This is quite a fun filled Halloween porch décor with a spider wreath. 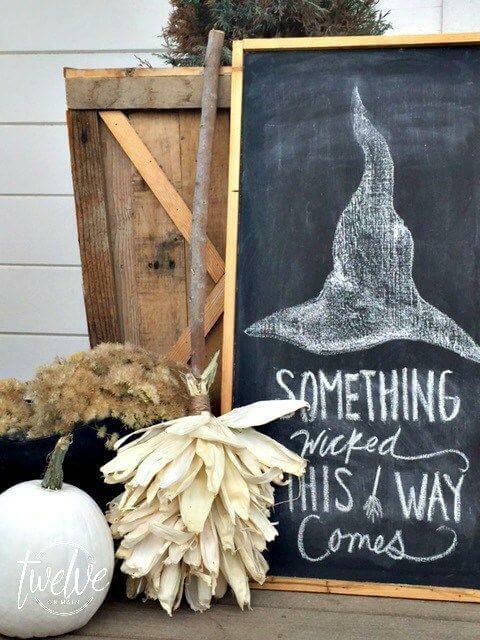 A simple item like a chalkboard sign can help you create a strong Halloween statement. You can add a couple of other elements also to make up for the space. 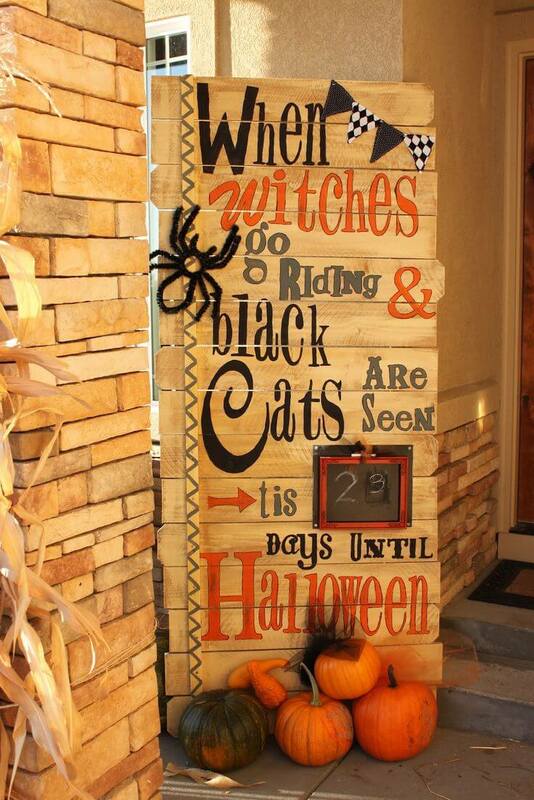 This is one of the classiest Halloween porch decoration ideas. 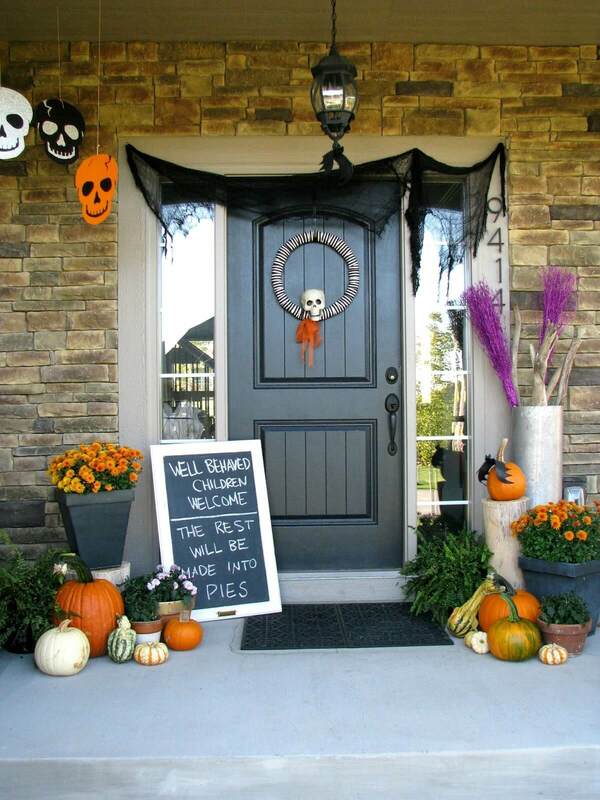 Hang the BOO wreath from the wall and place a couple of pumpkins. You’re sorted. You don’t always have to go for black and orange color palette for the Halloween. Black and white will exude the same feeling, as seen in the picture. The poppy flower planter is giving the much needed pop of color. 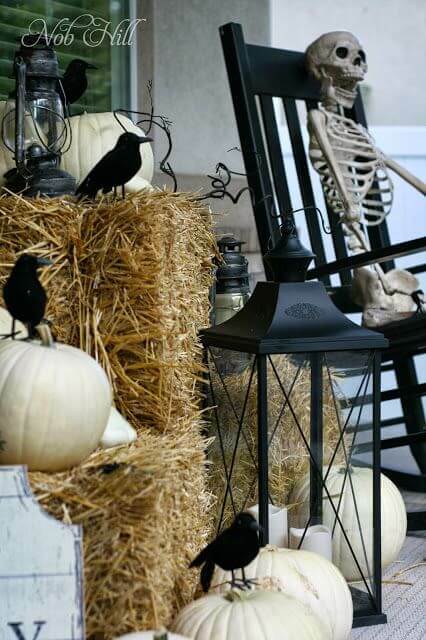 Could there be anything spookier than creating a graveyard scene on the porch? Just purchase a scary looking tombstone and get started. The image here will give you ample of inspiration. The cheesecloth drape and the creepy cages are creating a perfect Halloween scene. You can get this tattered cheesecloth by dipping them in black tea first and then ripping them apart. If hanging isn’t much fun for you, you can focus on whatever furniture you have on the porch. If you have a bench, you can deck it up in a similar way. 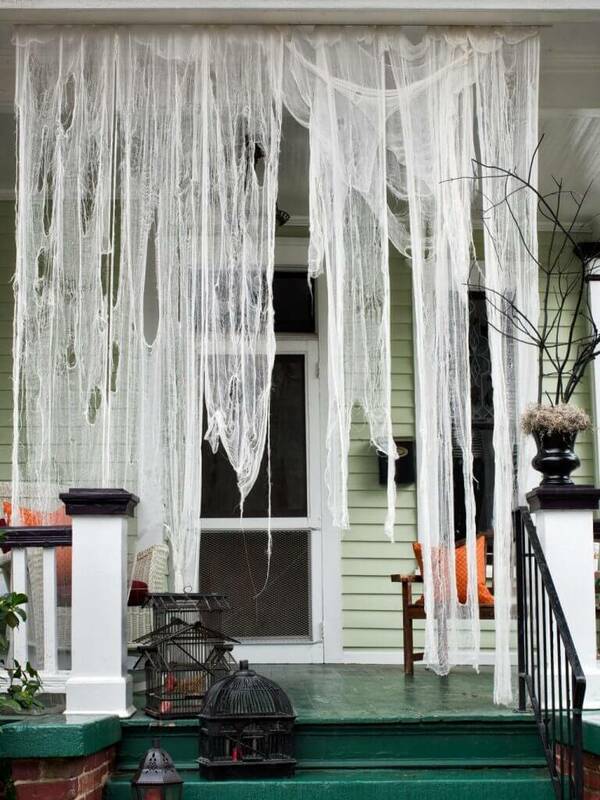 We’re rounding up the list with this most fun looking Halloween porch. 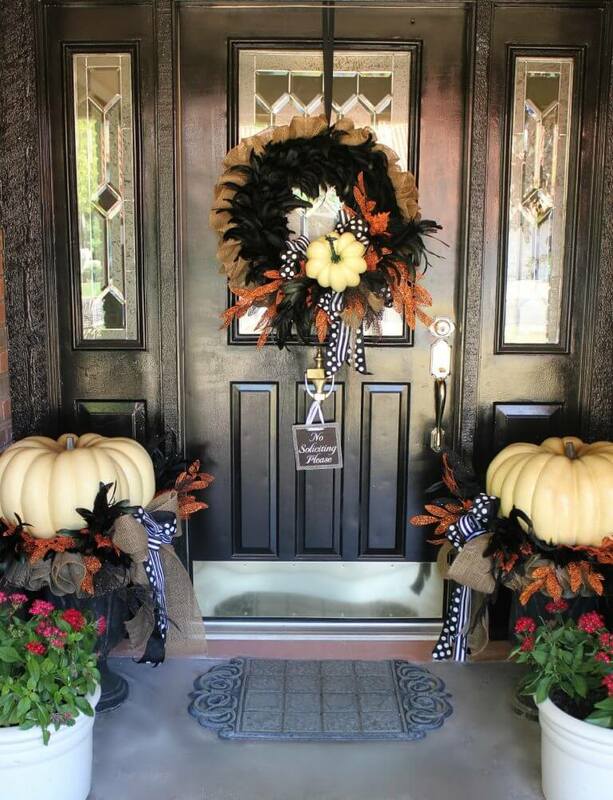 The door has been given the Frankenstein makeover and some white pumpkins are placed near the doors. 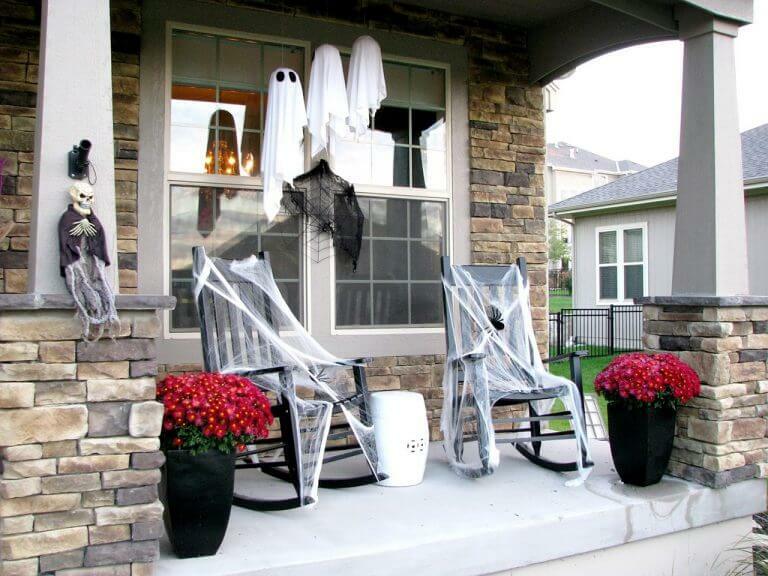 We hope our list of Halloween porch decoration ideas gave you ample of inspiration. If you have any more to share, let us know by commenting below.